With the United States apparently within days -- if not hours -- of launching a war against Iraq, this special two-hour FRONTLINE report, "The Long Road to War," relates the history of America's confrontation with Saddam Hussein. Drawing on eight FRONTLINE reports over the past 12 years, "The Long Road to War" focuses on key moments in U.S.-Iraqi relations, including U.S. policy toward Iraq during the Iran-Iraq war in the 1980s, the origins of the 1991 Gulf War and its ragged end, the frustrated attempt to disarm Iraq in the 1990s, and the long-standing effort by Washington foreign-policy hawks to remove Saddam Hussein. The program also examines what has been learned during this period about the mind and methods of Saddam. Beginning with excerpts from the 1990 report "The Arming of Iraq", FRONTLINE investigates how the U.S., in a cold calculation of its national security interests, helped Saddam Hussein in his bloody eight-year war with Iran, and how the Reagan administration worked to ensure that the Iran-Iraq war ended in a stalemate. U.S. policymakers hoped that a civilized Iraq would emerge after the Iran-Iraq war, but that hope was quickly shattered when Saddam's regime gassed thousands of Iraqi Kurds at Halabja on March 16, 1988. Saddam continued his build-up of Iraq's military arsenal -- aided by questionable Iraqi business deals with European and American companies. 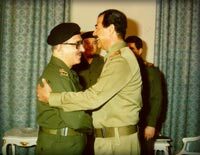 By 1990, Saddam had the fourth largest army in the world. In "To the Brink of War," which aired on Jan. 15, 1991, FRONTLINE went on to tell the story of how the first President Bush took on Saddam after Iraq invaded Kuwait in August of 1990. The problems confronting George H.W. Bush at that time are echoed in his son's situation today: trying to build a broad international coalition to oppose Saddam, depending on the stalwart support of a British Prime Minister, and facing the challenge of bringing along the American public. In interviews with decision makers such as Colin Powell and Richard Cheney from the 1996 report "The Gulf War", FRONTLINE examines the war's inconclusive victory. The decision to end the war and leave Saddam in power outraged defense policy hawks in Washington like Paul Wolfowitz, then the third-ranking civilian at the Pentagon. Wolfowitz would soon draft aggressive new policy guidelines for the Defense Department in the post-Cold War era, calling for a strategy of preemption to deal with Iraq and other potential adversaries. But, as FRONTLINE recounts in "The War Behind Closed Doors", Wolfowitz's draft went too far for the first Bush administration and was rewritten. The Gulf War section of "The Long Road to War" concludes with analyses of how Saddam Hussein may have misunderstood George H.W. Bush -- and vice versa. In an effort to understand what kind of man Saddam Hussein is, FRONTLINE produced two reports in the 1990s, "The Mind of Hussein" and "The Survival of Saddam", offering an intimate portrait of Saddam's early life, his rise to power in the Ba'ath Party, the beliefs and ideas that have shaped him, and his uncanny ability to survive numerous attempts to overthrow and even assassinate him. Throughout the 1990s, Saddam demonstrated his survival skills in defying sanctions and U.N. weapons inspections. For six years the Clinton administation struggled to deal with that defiance, but UNSCOM encountered increasingly tense face-offs with armed Iraqis as the inspectors worked to overcome the regime's elaborate concealment strategies for its nuclear, biological, and chemical weapons programs. FRONTLINE reports how an exasperated President Clinton finally responded with Operation Desert Fox, a four-day bombardment of Baghdad and Iraqi military installations by the U.S and Britain in December 1998, launched without the approval of the U.N. Security Council. By then, however, the weapons inspectors effectively had been kicked out of Iraq and the U.N. coalition supporting sanctions and inspections was falling apart. The policy of "containment" seemed dead. To the hardliners in Washington, it looked as though Saddam had won. The final part of "The Long Road to War," drawn from FRONTLINE's February 2003 "The War Behind Closed Doors", tells the story of how the election of George W. Bush renewed the debate over containment vs. preemption. With Colin Powell as Secretary of State and Paul Wolfowitz now in the number two position at the Defense Department, the administration was split between cautious realists, who favored containment and diplomacy, and hawks, who advocated a more aggressive and unilateral foreign policy. On Sept. 11, 2001, the battle of ideas came to a head. The group of hawkish advisers and policy thinkers in Washington seized upon the terrorist attacks of Sept. 11 to resurrect their policy of going after Saddam and changing the regime in Iraq. Through interviews with key insiders and journalists, FRONTLINE chronicles the internal political machinations and maneuvers that led the White House to abandon the long-standing policy of containment in favor of launching preemptive strikes against Iraq -- or any nation or group believed to pose a threat to American security. On Sept. 12, 2002, as America's march to war with Iraq continued, Bush seemed to be siding with Powell and the advocates of diplomacy when he addressed the U.N. and called for a new Security Council resolution mandating that Iraq disarm. But that very same week, the Bush administration also issued its "National Security Strategy of the U.S.", which spelled out for the first time the so-called "Bush Doctrine." Much of it reflected that controversial draft policy written back in 1992 by Paul Wolfowitz at the end of the first Gulf War: a reliance on preemption, a muscular U.S. posture in the world, and the statement that "the U.S. will not hestitate to act alone, if necessary, to exercise our right of self-defense by acting preemptively."